08. Check the flow path from 192.168.0.1 of Node-1 to 1.1.1.1/2.2.2.2, IGP path had changed for 1.1.1.1. 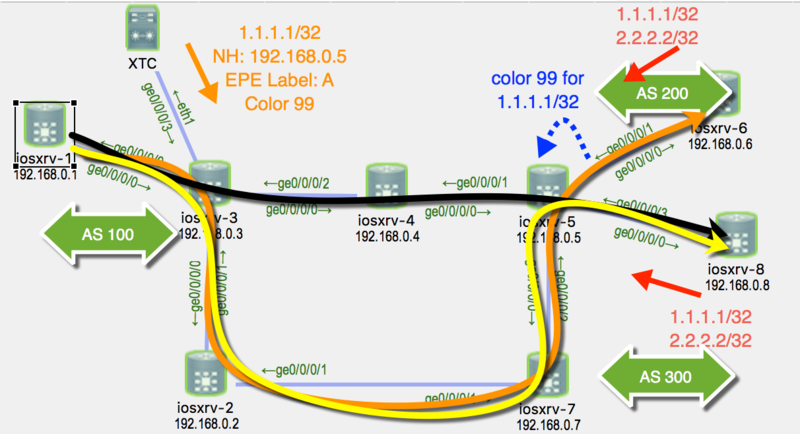 Please attention, if the customer has less prefix and not same as Telecom, we can not include Netflow and Openbmp, only control by BGP controller that is ok.
For this articles, show a demo for EPE, due to EPE only resolve the peering egress issue, so I combine our SRTE + ODN, that archive path control in IGP, the solution is much flexible! ODN is our great SRTE solution, that can scales/easy deployment SRTE, only control by color is ok. You will understand this key point after checking the article 🙂 If you have any questions, please let me know. BGP Controller deploys by our XTC. PCE Controller deploys by our XTC. BGP LU between XTC and ingress route Node-3. If no EPE and SRTE, traffic follow the Black Line from 192.168.0.1 of Node-1 to 1.1.1.1 of Node-8. After activating SRTE by TE metric, traffic will follow the Yellow Line from 192.168.0.1 of Node-1 to 1.1.1.1 of Node-8. After activating send EPE label by BGP LU on XTC Controller, traffics will follow the Orange Line from 192.168.0.1 of Node-1 to 1.1.1.1 of Node-8. Please attention, If our XTC Controller down, will not affect the traffics path, only affect peering egress selection.